GOYANG, South Korea (AP) — The leaders of North and South Korea vowed Friday to seek a nuclear-free peninsula and work toward a formal end to the Korean War this year, though their historic summit concluded with few specifics on how they will reach those ambitious goals. North Korean leader Kim Jong Un and South Korean President Moon Jae-in set aside a year that saw them seemingly on the verge of war. They grasped hands and strode together across the cracked concrete marking the Koreas' border. On the nuclear issue, the leaders merely repeated a previous vow to rid the Korean Peninsula of nuclear weapons, kicking one of the world's most pressing issues down the road to a much-anticipated summit between Kim and U.S. President Donald Trump in coming weeks. The summit marks a surreal, whiplash swing in relations for the countries, from nuclear threats and missile tests to intimations of peace and cooperation. 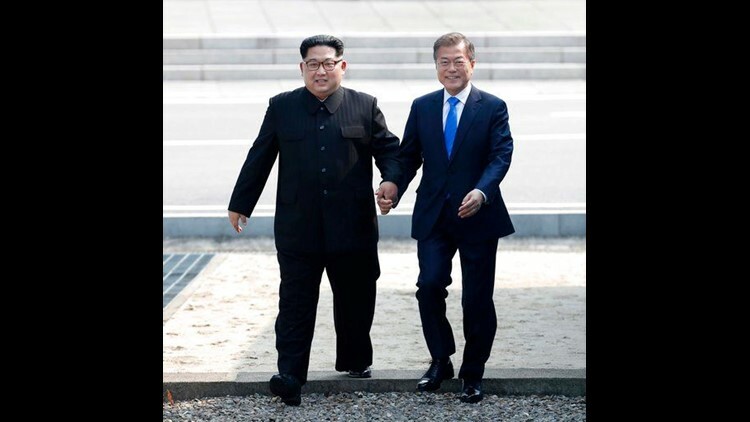 Perhaps the change is best illustrated by geography: Kim and Moon's historic handshake and a later 30-minute conversation at a footbridge on the border occurred within walking distance of the spot where a North Korean soldier fled south in a hail of gunfire last year, and where North Korean soldiers killed two U.S. soldiers with axes in 1976. Standing next to Moon after the talks ended, Kim faced a wall of cameras beaming his image live to the world and declared that the Koreas are "linked by blood as a family and compatriots who cannot live separately." The leaders also vowed to achieve "a nuclear-free Korean Peninsula through complete denuclearization," something they've said before. What happened Friday should be seen in the context of the last year — when the United States, its ally South Korea and North Korea threatened and raged as the North unleashed a torrent of weapons tests — but also in light of the long, destructive history of the rival Koreas, who fought one of the 20th century's bloodiest conflicts and even today occupy a divided peninsula that's still technically in a state of war. Trump tweeted Friday, "KOREAN WAR TO END!" and said the U.S. "should be very proud of what is now taking place in Korea!" Both Koreas agreed to jointly push for talks this year with the U.S. and also potentially China to officially end the Korean War, which stopped with an armistice that never ended the war. South Korean conservative politicians criticized the joint statement as letting North Korea off the hook by failing to secure a clear commitment on nuclear disarmament. Liberty Korea Party Chairman Hong Joon-pyo denounced the summit as a "show camouflaged as peace." But the Koreas made inroads on a raft of other points of friction between them. Moon agreed to visit Pyongyang, North Korea's capital, sometime in the autumn, and both leaders said they'd meet on a regular basis and exchange calls via a recently established hotline. They agreed to settle their disagreement over their western maritime border by designating it as a peace area and securing fishing activities for both countries. They said they'd open a permanent communication office in the North Korean border town of Kaesong and resume temporary reunions of relatives separated by the 1950-53 Korean War. Kim, during their talks, joked that he would make sure not to interrupt Moon's sleep anymore, a reference to the North's drumbeat of early-morning missile tests last year, according to Moon's spokesman, Yoon Young-chan. Kim also referred to South Korea's Yeonpyeong Island that North Korea attacked with artillery in 2010, killing four, saying its residents who have been living in fear of North Korean artillery have high hopes the summit will help heal past scars. Kim said he'd visit Seoul's presidential Blue House if invited. They then took a photo inside the Peace House, where the summit took place, in front of a painting of South Korea's Bukhan Mountain, which towers over the South Korean Blue House and where dozens of North Korean commandos trying to assassinate the then-dictator in Seoul were killed in 1968. Kim's sister, Kim Yo Jong, was by Kim's side throughout the ceremony, handing him a pen to sign a guestbook, taking the schoolchildren's flowers from his hand and scribbling notes at the start of the talks with Moon. AP writers Kim Tong-hyung, Hyung-jin Kim and Eric Talmadge contributed.